It’s not particularly stylish, as donning any VR headset makes you look like you’ve been kicked through the discount aisle of PC World, but the magic that’s going on under the headset is almost indescribable. Just be ready to apologise for the strange “ooooh” and “ahhhh” noises you’ll make while drooling at the gorgeous worlds blooming into life around you. And for those who just want to jump in and explore those gorgeous worlds right away, then our favourite VR headset right now is the Oculus Rift. Technology has finally caught up to what we first dreamt VR could be back in the Eighties, allowing us to enjoy our favourite games, films and apps in brand new ways. Whether it’s reaching out to select a button on a menu or riding on a rollercoaster while covered in Dorito shards on your living room sofa or ducking out of the way of a zombie’s bite, VR is technology that needs to be experienced to be believed. The good news is that the VR market isn’t swamped with headsets yet, so the problem isn’t sifting through dozens and dozens of options. The difficulty is understanding the distinct and unique strengths of each headset – knowing how and why HTC Vive headsets will fully immerse you in its worlds in a way that Google Cardboard can’t, for example. Which is why we’ve put together this guide to the best VR headsets on the market. To save you time, to save you confusion, and to let you know how you can dazzle your friends (and yourself) with the latest in cutting-edge technology. Ever since its Kickstarter campaign, Oculus Rift has been at the forefront of the VR revolution. Whether it’s been through the media being wowed by the tech or its acquisition by Facebook or its creator Palmer Luckey making the headlines, Oculus Rift has shaped the VR scene. That’s good news for those who want to invest in a VR headset. Not only are you getting a powerful VR headset packed with technology such as integrated headphones and a display for each eye, you know it will be relevant for years to come. Oculus Rift is already compatible with a solid range of games and PC apps and we don’t even know the full extent of Facebook’s plans for the tech. If you want future-proof tech and you have a beefy PC, get Oculus Rift. Imagine Resident Evil where the horrors are right there in front of you, clawing at your face with their disgusting, decaying hands. Imagine Ace Combat where you can see the missiles whoosh past your ear, fizzing as they harmlessly sail into the blue skies. Imagine a dating sim where you can reach out and touch… okay, we won’t finish that sentence. 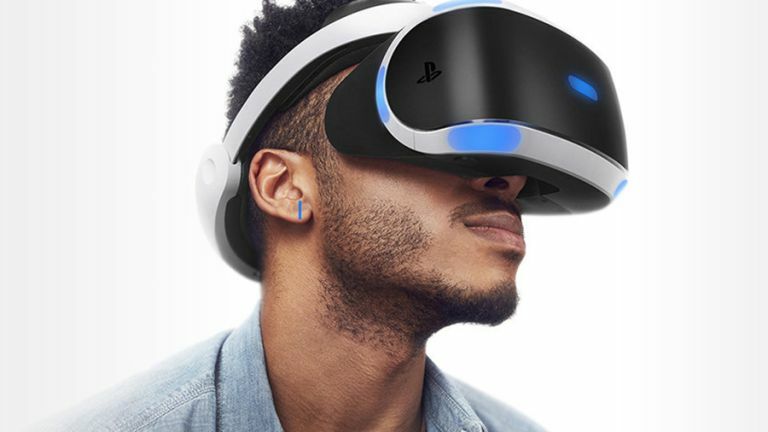 The point is that PSVR has arrived and developers have already begun to unlock the potential of PlayStation 4’s powerful virtual reality headset. There have been some gimmicky uses for it, sure, but it’s already being massaged into games in a more meaningful way than previous fads like 3D gaming were. Resident Evil is the flagship title for PSVR and with more on the way, this will become an essential PS4 peripheral sooner rather than later. When it launched, HTC Vive had two massive advantages over Oculus Rift. Yes, it was notably more expensive, but it let you roam around while wearing its headset, tracking your movement as well as what you’re looking at. It also had proper 3D, motion-sensing controllers – like Wii on steroids – while Oculus relied on an Xbox controller. Now admittedly that meant you needed a big area to use it in, and had to spend time sticking cameras on your walls or on camera-style tripods to make its tech sing – but get the set-up right and HTC Vive did what no other headset was capable of. The problem is, Oculus Rift now has controllers that are arguably even better – although also more complex, which makes them daunting for first-time users – and much easier to setup motion-tracking cameras. Vive's technical advantage is greatly narrowed, and it's still slightly more expensive than an up-to-date Oculus system. Even so, there's some great games available, letting you do everything from joining the cast of Star Wars in the battle for Tatooine to battling the elements on a treacherous climb up Everest. In tech terms, Vive remains ahead of Oculus, and it may even have done better in terms of early sales, but you have to ask realistically if HTC can provide the kind of backing for its headset that Facebook can. Despite not delivering 'proper' VR, Daydream View is the most comfortable VR headset on the market and it even works 100 per cent fine with glasses on too. It has it's flaws, the biggest being the amount of dust that can settle on the lens, and we have questions about its long term durability, however the performance delivered for the price is very attractive. Obviously, resolution is going to depend on what smartphone you use with the headset, as View is another slide-your-phone-in number. The Pixel XL does a decent job for example, but it’s not quite as sharp as the S7 Edge in Gear VR. But if you’re not comparing these back-to-back, that’s not really a problem. There are 50+ 'experiences' too, including YouTube, Guardian VR, New York Times VR, WSJ VR, Netflix, Wonderglade and Lego. VR was considered a costly exercise, reserved for those with eye-watering bank balances at the forefront of tech. Google Cardboard changed all that with… a piece of cardboard. That’s it. It’s strange to think that the same material that houses your morning bag of cereal could change the VR industry but that’s exactly what happened. Google released a bit of cardboard that can be folded with two lens that can house your smartphone with a supporting app, held to your face with your hands rather than with a strap. And that’s it. Over five million Google Cardboard headsets have shipped in different forms, making it the most disruptive tech that’s been created in recent times. If you want to experience the wonder of VR without forking out truckloads of cash, Google Cardboard is the clear choice. The problem with Google Cardboard is that it’s… well, cardboard. Not that we’re being snobby but you can’t bring friends round to your house, show-off your new tech and then unfold some cardboard and expect them to be wowed. And wowing other people, let’s be honest, is a big part of technology’s appeal to begin with. Samsung Gear VR is at the midway point between tech that will make you weep tears of joy for how good it is (and tears of sadness at how much it cost) and the obvious budgetary restrictions of Google Cardboard. All you need is a Galaxy smartphone to slot into your headset and you can use Samsung Gear VR for anything from browsing Netflix to playing games like Eve Gunjack.